Ferns and their allies are some of the most ancient vascular plants, dating back some 360 million years. The only other vascular plant group that is older are the lycophytes, sometimes called lycopods or clubmosses. The discussion here will include all true ferns, plus a few spikemosses and clubmosses. All of these plants have a true vascular system, though only ferns ( Pteridophytes) have true leaves, known technically as megaphylls. 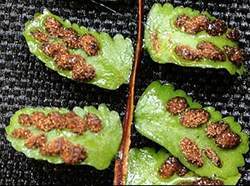 Reproduction is done through spores, not seeds, and these are produced in specialized structures on the leaf surface.In ferns clusters of spores are called sori and are often covered by a protective tissue while young known as the indusium. After maturing the spores are wind dispersed and germinate. The germinated spore grows into a haploid (containing half the genetic information) generation known as the gametophyte. As this ages it forms a photosynthetic structure known as the prothallus that in turn produces both male and female gametes – sperm and eggs. The eggs remain fixed to the prothallus, but the sperm must swim to an egg to fertilize it. This is one reason why ferns grow in wet areas, or areas that at least have a wet season. If they grew only in a dry place they couldn’t reproduce because the sperm wouldn’t be able to swim to the egg and fertilize it. Interestingly, this is also how ferns occasionally hybridize. Sperm from one species swims to the egg of a different species and fertilizes it. This need for nearly wet conditions during the gametophyte generation is important when trying to grow ferns from spore. Once the egg is fertilized, a diploid (containing the full complement of DNA) zygote is made, and thus begins the sporophyte generation. This generation is the one that grows large and what we commonly recognize as “a fern”. It in turn produces more spores and the cycle goes on. This cycle is called alternation of generations.Ferns, spikemosses, and clubmosses are found throughout the world, a thing not unexpected from such an ancient group of plants. They can be found on every continent except Antarctica, almost any island (no matter how isolated), and range from the deep tropics to almost the arctic circle. Likewise they inhabit an astonishing range of habitats, from grasslands, to temperate forests, to windswept tundra, tropical and temperate rain forests, swamp lands of all latitudes, semi-deserts, and some are even found in lakes, both floating on top of the water and some submerged. We tend to think of ferns as growing in the ground, that is, as a terrestrial plant, but in truth many ferns and fern relatives can be found growing on rocks (lithophytes) or on other plants (epiphytes), typically on trees. Some species can be found throughout much of the world, such as Lycopodium clavatum (found everywhere but Australia) or Asplenium trichomanes which can almost literally be found anywhere – from the subactic regions of Asia to the tropical mountains of Africa, stonewalls in Europe, the Hawaiian Islands, Cuba, and almost anywhere else you can think of. Some species are obligate terrestrials, while others only found as epiphytes or some only as lithophytes. Others still can be lithophytes or epiphtyes, yet others can be all three at the same location. I’ve seen extensive colonies of the Japanese native fern Microsorium buergerianum growing up trees, on thin twigs of bushes, over rock faces, and in deep rich loamy soils – and all of this in just a few square meters! It is estimated that no less than one third of known fern species are epiphytic – a fact that might startle the layman’s idea of what a fern is.As diverse as ferns are in habitat, they are equally so in habit. A dizzying array of forms exist, even within the main group (known as leptosporangiate ferns). Some grow in clumps, while others grow as vines up trees. Yet others spread by underground stolons or some grow as actual trees complete with a trunk. The basic leaf form tends to be pretty simple, the typical fern leaf known as a frond, but in truth variation is extreme. Each frond is composed of a blade (the leafy looking part) and the stipe (the stem part, called a petiole in many other plant leaves). The stipe is commonly covered in scales, but can also be naked or sometimes hairy and occasionally even glossy or spiked. Depending on the species it can be very long or very short. The blade itself is composed of the rachis (the central stem of the blade) and the pinnae (little leaflets coming off the rachis). The pinnae can in turn be divided up to four times, so you hear the terms once pinnate, twice pinnate, three times pinnate, and four times pinnate to describe different species. If the pinnae are undivided the fern is known as once pinnate. If the pinnae are once divided then the resulting frond is twice pinnate, and so on. The divisions of the pinnae are called pinnules and the central vein of them is called the costa. Some ferns don’t have any pinnae at all, and so look like a normal plant leaf, more or less, and are known as simple fronds.If that weren’t enough, some ferns have different frond forms from the typical type. One of the more obvious groups are the Gleicheniaceae, the forked fern family. As the name suggests, the frond grows in a fork shape with two long divisions growing at an angle away from each other. These ferns grow new fronds from both the base of the plant as in more typical ferns, or they can grow a new frond from between the dividing point of the frond’s two divisions – a condition known as pseudodichotomous branching. The resulting habit is almost vine-like with plants trailing along the ground.All ferns have a stem that either trails along the ground, is underground, is vine-like, or forms an actual trunk. This stem is called a rhizome. Off this grows the roots, either into the soil or onto some other substrate. Off this also grows the fronds from a growing point, commonly called the crown. Again, the variation between species in the rhizome and roots is extreme and there is no easy way to generalize about them. Some ferns grow no definite crown at all. In some species, such as the floating water fern, Azolla, the rhizome is underdeveloped. In other species, such as the massive tree fern, Cyathea medullaris, it can grow 20 meters long!Ferns have long been important for people as a food source, a building material, of course in the horticultural trade, and even in making traditional religious objects. Tree fern fiber is a common additive to many epipyhtic plant composts and that in itself is a rather large local industry where these ferns live. In addition, some lycopods have been researched for possible pharmaceutical drug development. Complex, ancient, and varied, these plants by their very nature are here to stay probably long after humans are gone from this planet. Japan is home two miniature spleenwort ferns, Asplenium trichomanes and Asplenium incisum. Both frequent rocky outcrops, with the former preferring moist sites in the shade while the latter is found in brighter places that are on average much drier. Asplenium trichomanes is a tiny semi-evergreen fern. Throughout the growing season it throws its tiny fronds in a small, loose rosette. Each frond is once pinnate and between 5-10 cm long. The pinnae are slightly lobed, roughly oval in shape, and grow in an alternating pattern down the black, wire-like rachis and average no more than 0.5-1 cm long each. They are a dark blue-green color. The oval sori grow in pairs on opposite sides of the costa. The black stipe is quite short. Both the stipe and rachis are scaleless. It commonly forms large colonies even coating rock faces, but also can be seen in small groups. Asplenium trichomanes commonly grows in large colonies. This is a truly worldwide fern being found on every continent except Antarctica and even on some Pacific Ocean islands including Hawaii, and is represented by a number of subspecies throughout its impressive range. In Japan it is widespread from north to south. Some subspecies are polyploid (having more chromosomes than the normal compliment), but the Japanese plants are not. This is a fern that grows on rocks or in the cracks of them exclusively. On Kyushu it seems to prefer wet rock faces that are also subject to seasonal drying. It grows from bright to dark shade. Here is a remarkable little fern. It can be found scattered around almost every temperate climate across the globe as well as some subtropical areas, and even odd places such as the mountains of Yemen and east Africa. In Japan it likes to grow in the company of its own kind and also alongside many other lithophytes including various types of fern, selaginellas, mosses, lichens, and so on. Despite its delicate appearance, it can withstand drying even to the point of seeming death. It can be found hanging completely desiccated in loose groups of crumpled fronds, however, like many lithophytic and epiphytic ferns, come the next rain its foliage re-hydrates and looks as good as new. Another desirable feature it has is its truly miniature stature. This is one tiny fern, usually not exceeding the breath of a human hand. This one may not be a rarity, but it is a delightful little denizen of Japan’s rocky forests. The sori of Asplenium trichomanes. The Japanese name for it, chasenshida, is rather whimsical, meaning “tea whisk fern” from the words chasen (“tea whisk”) and shida (“fern”). The overall shape of the fern uprooted looks much like a bamboo whisk used to make macha tea. A. incisum is very similar in size and form to A. trichomanes. Obvious differences are that the pinnae are strongly lobed, the rachis is green, and the pinnae are a light green color. Each pinna is much more elongated than in A. trichomanes and the variation in size, shape, and spacing along the frond’s length is more pronounced, with the middle blade pinnae being the longest and largest. While the sori grow in an alternating pattern on opposite sides of the costa, they are elongated as well. It is most commonly seen singly or in small groups, but occasionally occurring in larger colonies. Seldom heard of outside their native range, the Plagiogyria species of warm temperate Japan are common evergreen ferns of wet, humid forests. Their Japanese name is kijinooshida meaning “pheasant tail fern” since their broad, once pinnate fronds vaguely resemble the tails of those fowl that frequent the same woodlands. They are in fact delightful to the eye, yet elusive since they seem rather difficult in cultivation. Plagiogyria japonica is a common, small evergreen fern with two distinct frond types: fertile (sporophyll) and sterile (trophophyll). The sterile fronds are more showy with broader pinnae, and are 8-30 cm long and 3-8 cm wide. The pinnae are simple, flat, and oblong. They extend nearly from the base of each stipe to the very tip of frond in opposing rows presented in a flat plain, and are longer at the center of the frond with each one 1-4 cm long and 5-8 mm wide. The fertile frond of Plagiogyria japonica showing the mature spores. 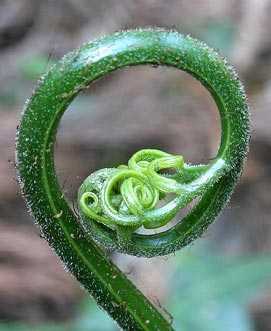 The sterile fronds grow in a lovely rosette and usually have an elegant arch to them. The fertile fronds grow vertically, are much taller, and have much more narrow pinnae. They stand 15-45 cm high and 3-8 cm wide with each pinnae being 2-4 cm long and 3-5 mm wide. They too are born in opposite pairs on the stem but are highly reduced towards the stipe, and grow much looser on the stem as well. The croziers start out bright electric green to deep red and the new fronds often have this same color for some time. The plant grows from a simple branch less, creeping rhizome. This fern is found from central Honshu (Kanto region) westward to Yamaguchi Prefecture and throughout Shikoku and Kyushu in any moist forest in deep to light shade, but is most frequent and vigorous near streams and seeps. It also seems to like rock walls and rock cuts provided there is ample water. Found from sea level to ~1000m. Plagiogyria japonica is a lovely evergreen fern of Japan’s humid, warm temperate forests. These are very attractive ferns, very reminiscent of a Blechnum which I mistook them for at first. Like members of Blechnum, the dimorphism between fertile and sterile fronds is great. The fertile fronds are amazing to watch as they unfurl: they start all coiled up and slowly unfurl into exquisite lime green, wire-like structures. They are a sight to behold on a fine spring day with the sun back lighting them. Many months later, in late fall, they are heavy with brown spore. This fern is widespread through the mountains here. In all respects it is a most lovely small fern. Japan’s moist woods are home to a small growing Blechnum species, B. nipponicum, that may either be distinct, or a variety of the much more far ranging species, B. spicant, the deer fern. Regardless, this one is special in my mind, a perfect looking fern, worthy of any serious gardener’s eye. Blechnum nipponicum is a small evergreen fern with two distinct frond types, fertile and sterile. Both are once pinnate and uncomplicated looking. 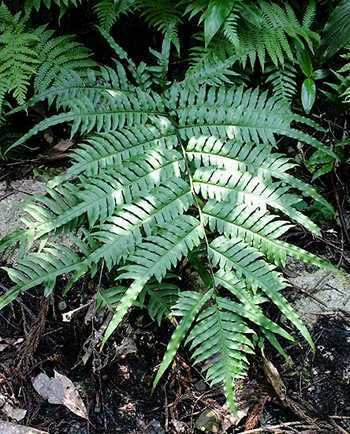 The sterile fronds are more showy with broader pinnae, and are up to 8-30 cm long and 3-8 cm wide. The pinnae are simple, flat, and oblong. They extend nearly from the base of each stipe to the very tip of the frond in opposing rows presented in a flat plain, and are longer at the center of the frond. 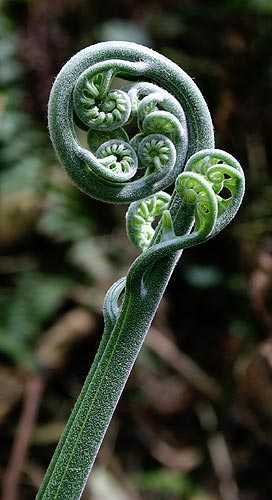 The sterile fronds grow in a lovely rosette and usually have an elegant arch to them. They stay close to the ground rather than growing vertically. Once mature, the rosette of sterile fronds turn a gorgeous brilliant green. The Japanese name, Shishigashira, meaning “lion’s mane” is perhaps a reference to its outward appearance – a lion’s head! The fertile fronds grow vertically, are much taller, and have much more narrow pinnae. They also are born in opposite pairs, but are highly reduced towards the stipe end, and grow much looser on the blade as well. The indusia and accompanying sori are long and linear, originating at the base of each pinna and extending nearly the entire length of it. They occur in pairs on either side of the costa. The croziers start out bright electric green to deep red and the new fronds often have this same color for some time. 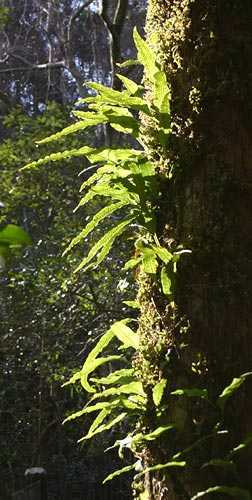 These eventually grow progressively darker green, a common trait in many ferns, especially Blechnum species. 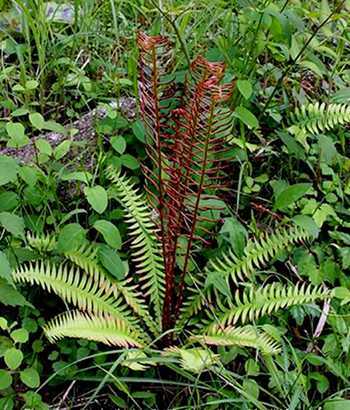 The erect fertile fronds of Blechnum nipponicum expand a bit later than the sterile ones, and flush a deeper red color. Whether is species is distinct or falls within Blechnum spicant is still in question. It is a relatively small form regardless. It occurs in small colonies or as individual plants in any moist forest in deep to light shade, but sometimes can be seen on sunny roadsides in thick growth with grasses and small shrubs. Like many other types of fern, it readily colonizes raw earth in cuts created by roads, paths, and landslides as well. Found from near sea-level to 1000+ m, but most common in lower elevations, 200-400 m.
This species is apparently widespread on the mainland islands of Japan. I’m unsure of its presence on the islands south of Yaku Island (where it is represented by a dwarf race, or so I’ve heard), or in neighboring Asian countries. This plant is also treated as a variety of the circumboreal species B. spicant, with which it is obviously very closely allied, commonly called deer fern. Given that fern’s incredible range, extending from England throughout much of Europe to the Caucus Mountains, north Africa, northeast Asia, and western North America, it is not surprising that various forms have evolved. Whether this plant falls into B. spicant or is distinct is still in question. Two lovely evergreen ferns of Japan are Coniogramme intermedia and C. japonica. Of the two, C. japonica has become well known in western horticulture as the “bamboo fern”, but the other is rarely, if ever seen. Both are remarkable ferns, worthy of a place in any collection, and harbor a hope of being fairly cold hardy. 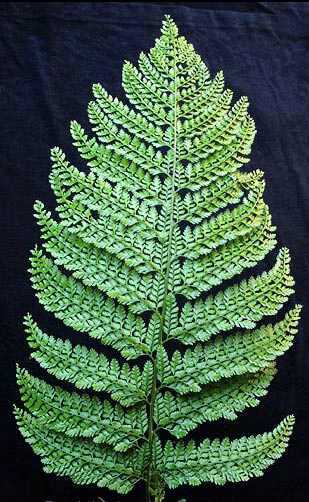 Coniogramme intermedia is a medium to large size evergreen fern with a short creeping rhizome. 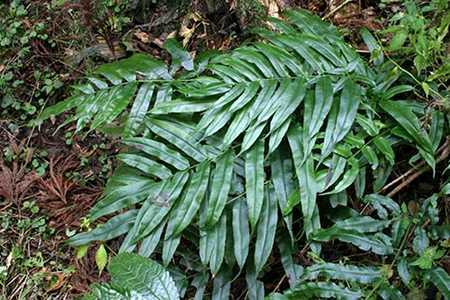 The fronds are basically once pinnate, deep green, glossy, and up to 60-100 cm long and 25-35 cm wide. The basal pinnae can be divided once more, sporting shorter pinnules, but these number few and the apical pinnule is the largest by far. The pinnae have lightly toothed margins. The scaleless stipe accounts for approximately 1/3 or the frond length. The naked sori occur in lines that follow the pinnae veins. These can separate up to three times but never cross one another, and extend up the veins 1/2 to 3/4 of the way to the margin of the pinnae only. The crozier of Coniogramme intermedia is wiry and small – you would not imagine it would expand into a large frond. 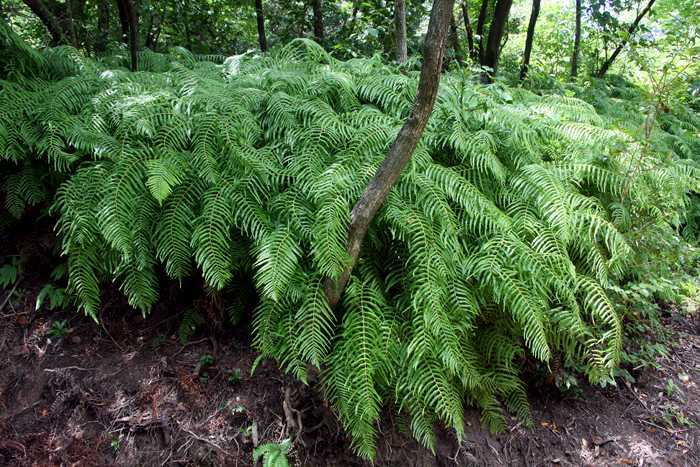 This fern is commonly seen as single clumps in wet forests, often along streams and seeps from low to mid elevations, 100-600 meters, on Kyushu Island. It is a widespread species, growing across Japan from Hokkaido and southward. It is also reported from Korea, Taiwan, and China. Of the two Coniogramme species found in Fukuoka, this one is the more lovely to my eye. It tends to grow its pinnae more close together, and they are broader in comparison with those of C. japonica, giving it a more robust and luxuriant look. An added feature is that the pinnae taper rapidly towards their ends, thus producing a tail-like shape. The pattern of the sori also differs from its cousin. The naked sori occur in lines corresponding to the leaf veins, and these can branch two and sometimes three times, but these divisions never cross over each other. Also, the sori never extend fully out to the margins of the pinnae, but usually fall well short. In C. japonica the sori often cross over to each other and they extend nearly to the margins of the pinnae. This is a common fern in moist valleys and near streams and can often be seen growing with its cousin C. japonica. Several varieties have been recognized and named, their differences mostly having to do with pinnae shape and how far the sori extend to the pinnae margin. A natural hybrid, C. x fauriei, also exists between this species and the more common C. japonica. In my book Coniogramme intermedia is the lovelier of the two species in Fukuoka. C. japonica is larger growing than its relative, but likewise is evergreen. The fronds are twice pinnate and glossy, growing up to 60-100+ cm long and 40-60 cm wide. The pinnae are divided half way up the blade, and the remaining pinnae are undivided. The basal pinnae are the most divided, having four to six pinnules each, giving the frond a more complex look. The pinnae have lightly toothed margins and taper gradually to form a lanceolate shape. The scaleless stipe accounts for approximately 1/3 or the frond length. The naked sori occur in lines that can branch up to three times and occasionally cross over one another, and extend up the veins almost to the pinnae margins. The lower mountain forests of Kyushu boast some of the largest fern species. In this discussion we’ll look at the four largest types of fern in the area around Fukuoka Prefecture. These include two species of Pteris, as well as two species of Woodwardia. The crosier of Pteris excelsa is one of its nicest features. Pteris excelsa is a tall evergreen fern with two frond types that are morphologically distinct: the sterile fronds (the trophophylls) and the fertile fronds (the sporophylls). 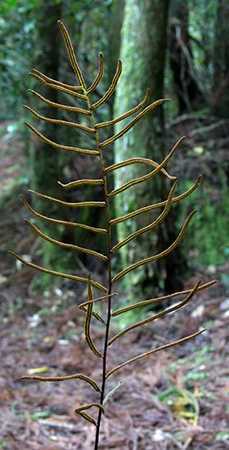 The sterile fronds are twice pinnate with the end of each pinna ending in a spear-like pinnule that occur in an irregular pattern. They are up to 150 cm long and around 60 cm wide. These tend to grow horizontal to the ground or arch downwards. The fertile fronds are much taller and stand nearly erect, sometimes as high as 240 cm long. They lack the spear-like terminal pinnules of the sterile frond, and each pinnule tends to be much more narrow as well. The emerging crosiers and stipe are covered in a light white pubescence, but this is lost once the frond is mature. The sori are born on the outer margins of the pinnules, covered by the folding in of the margins. 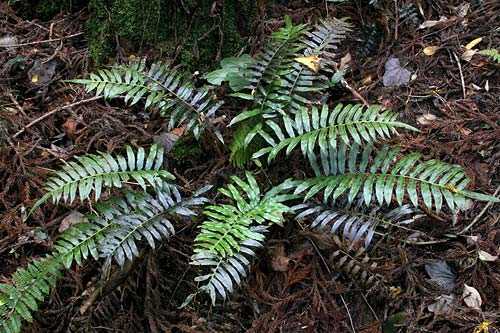 This fern is most commonly found in lose small groups, often growing on wet seepy slopes and relatively bright forests, but occasionally next to stream sides. It occurs at fairly low elevations, 50-600 meters. This is a big fern, in fact taller than Woodwardia orientalis, the most massive and impressive fern in Fukuoka. The growing crosier is a sight to behold with each pinna all curled up, ready to unfurl. Furthermore it is covered in a light white pubescence which is stunning to see in person. This is definitely one of Fukuoka’s more spectacular ferns. The sterile fronds of Pteris excelsa have an odd, spear-like terminal pinnule. A fern that looks more like a true bracken, Pteris wallichiana, is large, evergreen, and clumping. Both sterile and fertile fronds have nearly the identical look and dimensions. The stipe stands almost vertical, is completely smooth and scale less, and accounts for over 2/3 of the frond length growing up to 130 cm high. At the highest point of the stipe the frond branches out in three directions. The outer branches divide once more to form two forked branches. The center branch grows the longest and doesn’t divide again. The result is a palmate blade forming a lopsided circle ranging from 60-80 cm wide. The fronds are twice pinnate and the pinnules are slightly lobed. As in the former species, sori are born on the margins of the pinnules and are protected by false indusia that are in fact the pinnule margins folding in and over the sori. Plants can form large clumps in time. 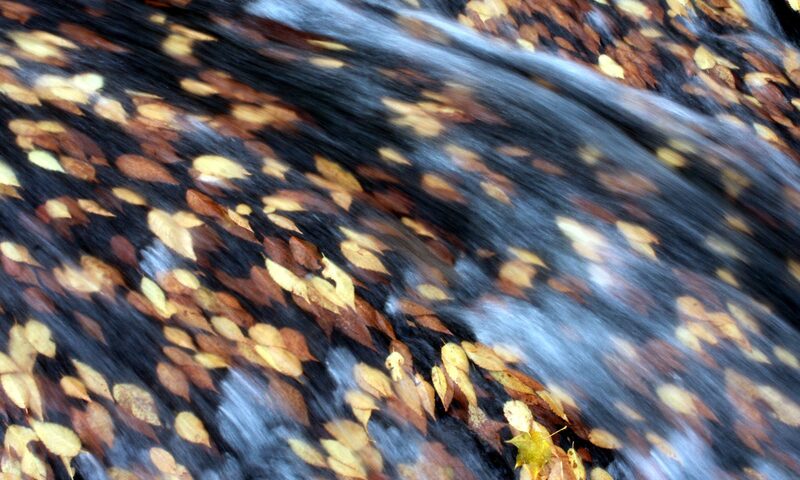 This species seems to like moist to wet slopes in bright woods, tree plantations, and also along streams. It is found at low to mid elevations, 300-500 meters. 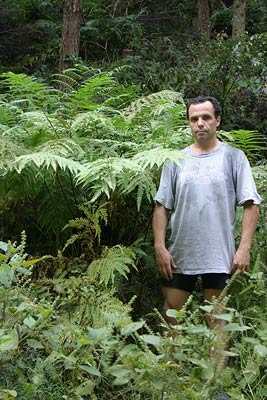 Yours truly beside a clump of Pteris wallichiana in habitat, Hisayama Town, Fukuoka Prefecture. Here’s another one of Fukuoka’s oversized ferns. 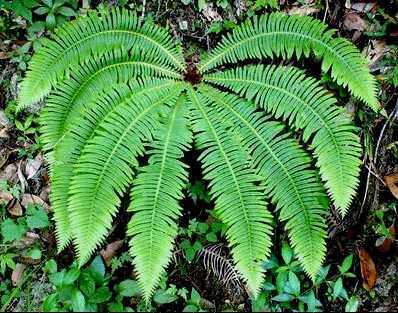 The frond can measure nearly 2 meters in length, stand up to 1.3 meters high, and be nearly a meter wide. Now that’s a nice big fern! The bulk of its range lies in southeast Asia in decidedly subtropical to tropical regions, although it can be found up to the central coast of Honshu. While it appears to be evergreen here, I’ve heard that it is deciduous in winter further north. Here’s a video showing not only Pteris excelsa and P. wallichiana, but also four other Pteris species common to northern Kyushu: P. multifida, P. cretica, P. nipponica, and P. dispar. The forked ferns, family Gleicheniaceae, are some of the more striking looking. Their forked habit of branching sets them aside as something truly unique. On Kyushu, southern Japan, two species are common, Dicranopteris linearis and Gleichenia japonica, where they inhabit lower elevations on slopes either in woodlands or on exposed sites. Let’s have a closer look at these odd ferns. Gleichenia japonica is an evergreen vining fern with long trailing rhizomes. Crosiers can originate from the rhizome or from the fork of the branched fronds (pseudodichotomous branching). The new fronds are brilliant lime green and mature to a light green or to dark green depending on exposure to the sun. Each branch is 20-70 cm long and forms a distinct forked frond. Total frond length can be 1 m. The stipe is relatively short, 15-30 cm long, and the thicken base is covered in dark brown scales. Gleichenia japonica often grows in large rambling colonies on moist hillsides. As new crosiers are formed, the resulting vine-like chain of fronds can extend for several meters and form dense colonies. The frond is twice pinnate, but the pinnules are unlobed. The undersides of the fronds are a white-blue color (hence the Japanese name, urajiro, meaning “below white”). Spore production is rare. The circular and naked sori grow in pairs on either side of the costa. Crosiers of Gleichenia japonica form at the point of the fork in the frond. This bud-like crosier can wait for several months before expanding. Forming large, dense colonies on hillsides, this species can often be seen growing alongside its near relative Dicranopteris linearis, but often is found on moister sites in heavier shade. It also is a much larger fern. Colonies can adorn whole hillsides, creating a startling visual impact, albeit a bit rambling and “messy” looking. Within the nearly sopping wet subtropical low elevation forests of southern Japan one can easily find ferns growing not only in the ground, but also on every imaginable perch. This article focuses on four species that are found either growing on rocks (lithophytic habit) or on trees (epiphytic habit), but that can also colonize soils, in particular the moist or even wet ground near mountain streams. As one might expect, such places give the impression of the lushness of a tropical rain forest, however such forests are in fact temperate, albeit with a strong influence of subtropical flora. 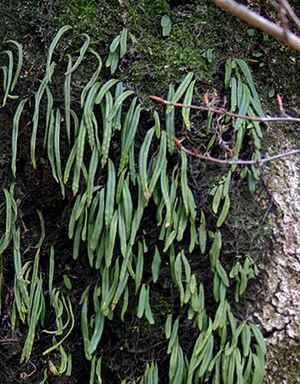 First, we’ll look at the genus Neocheiropteris, represented in the forests of Fukuoka Prefecture by two species, N. enstata, and N. subhastata, the former being a conspicuous ground and rock fern in many forests while the latter showing itself to be a shy cousin with great flexibility in habitat choice. Neocheiropteris ensata can often be seen growing in dense colonies on rocks. N. enstata at first glance might be mistaken to be a species of Pyrrosia. That is what I thought it was the first time I saw it. It grows either as a lithophyte or terrestrially, but always in a place with abundant water (one thing that sets it apart from Pyrrosia which like drier sites). The fronds of Neocheiropteris ensata are deeply ribbed. 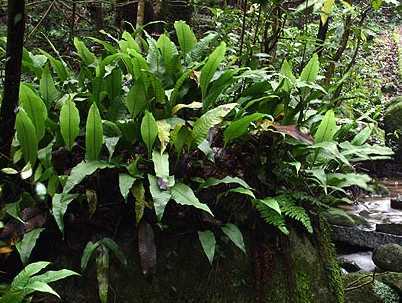 Along streams it can form lush mats on top of flat rocks, however, it is just as happy to grow in the ground. I’ve not seen it growing as an epiphyte in the Fukuoka area, but in exceptionally wet climates it could possibly grow in trees. Occasionally colonies can be continuous carpets of fronds. Another place you sometimes find it is on rocks on seepage slopes. Here the plants never dry out and in fact the roots are nearly under water much of the growing season. The large, broad shiny leaves are deeply ribbed making it an attractive plant. The round, naked sori are in lose pairs on either side of the midrib of the frond, a diagnostic feature. It is usually seen at low elevations, not more than 400 meters high in the Fukuoka area. A far rarer fern than its common relative, N. subhastata can be found growing low on trees, on rocks, and also in the ground. I first found it growing low on trees next to a stream, and even growing on dead bamboo canes. At first I thought it was Microsorium buergerianum, a fern it closely resembles, although when seen side by side the differences are obvious. These plants had simple elongate fronds with undulating margins and sori resembling both Microsorium and N. enstata. Further upstream from these was a colony of very small ferns with distinctly triangular fronds growing over a mossy rock surface and terrestrially. I immediately remembered seeing this fern in a picture and guessed it to be N. subhastata. Neocheiropteris subhastata growing as an epiphyte on a small tree. I returned time and again to look for spore on these plants, but I could never find any. One day, a little further downstream, I saw some of this same triangular frond fern growing in humus on a huge boulder. I followed its trailing rhizome and remarkably as it grew out of the humus and became a true lithophyte on the rock surface, the fronds “turned into” the elongate frond fern I found downstream. I immediately saw my mistake and realized that this was indeed one species with two distinct frond types. The terrestrially growing fronds are short, triangular, and sterile while the lithophytic or epiphytic fronds are elongate and fertile and have a small auricle on one side of the base of the frond. Like E. enstata, the sori are in round and naked in lose pairs on either side of the midrib of the frond. This is a much smaller species than N. enstata, so the two cannot be confused. This species seems to require high humidity to survive. I’ve only seen it at low elevation, ~300 meters or less. Southern Japan has a peculiar climate that has allowed essentially subtropical forests to exist in what is technically a warm temperate climate with four distinct seasons. This forest is home to many orchids and ferns that one wouldn’t expect to find in a place that happily supports such things as daffodils, cherry trees, and temperate rhododendrons. Among these are the epiphytic and lithophytic fern species that make their last northern stand on the islands of Kyushu, Shikoku, and the southeastern coast of Honshu. This article is the first of several about these northern stragglers. The following species can all be seen within a short bike ride from my house on the eves of Kyushu’s largest metropolitan area, Fukuoka City, and in fact could even be called epiphytic weeds. Lepisorus thunbergianus in a desiccated state. When the rain comes these fronds will get plump and dark green again. 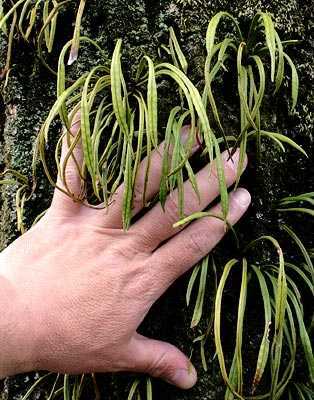 Without a doubt, southern Japan’s most common and widespread epiphytic fern is Lepisorus thunbergianus. It can be found on almost any tree or stone wall whether it’s in the country or city. In truth, some of the most dense colonies I’ve seen are in urban parks and cemeteries. Not surprisingly it is also the most conspicuous epiphytic plant species around. To the untrained eye it might seem to be some strange grass growing up in the trees since it grows in clumps and has long, grass-like fronds. 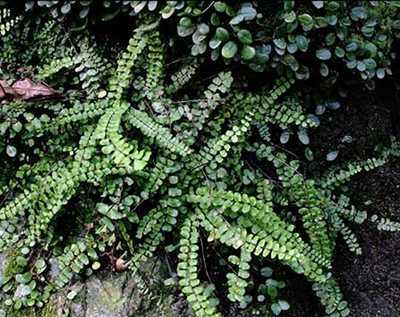 It often is found in association with Fukuoka’s next most common epiphytic fern, Lemmaphyllum microphyllum. 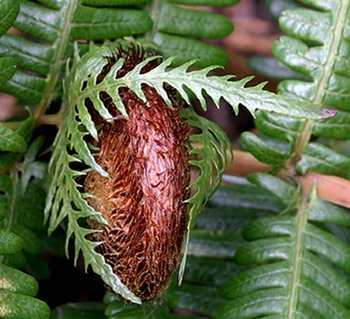 The sori of Lepisorus thunbergianus are round and naked – lacking the covering called the indusium which protects many other fern species spores. L. thunbergianus is found growing on the boles, branches, and even twigs of trees. It also grows on any available rock surface, concrete wall, or wood structure such as a wooden roof or post. While usually found at lower elevations, it can also grow higher up in mountains, up to 800 meters or more. Truly, this isn’t a picky fern, but it cannot survive on the forest floor. Many thousands of plants fall to the ground, and they all perish with no exceptions. In dry weather the fronds crinkle up and look positively dead, but the next rain they plump up again. This is a species that will never be in short supply in Japan. A smaller relative to L. thunberianus is the diminutive L. onoei. In the Fukuoka area this species is confined to higher mountain ridgelines, usually above 700 meters elevation. At these altitudes the more common L. thunbergianus is replaced by this more diminutive species where it can form extensive colonies on tree trunks. Other than simply being smaller in stature than L. thunbergianus it also has a rounded frond tip, a diagnostic feature. See the comparison shot of the two species growing side by side to see the difference. As seen in the picture, L. onoei is less than half the size of L. thunbergianus. It is a lovely little plant of cloud shrouded mountain ridgelines, at least in the Fukuoka area. Lepisorus onoei in habitat at 1000 meters elevation, Sefuriyama, Fukuoka Prefecture. Next to L. thunbergiana, Lemmaphyllum microphyllum comes in a close second as Fukuoka’s most common epiphytic fern. In truth it is just as happy growing on rocks as it is on trees. In either case it can form impressive colonies, virtually covering the entire bole of a large tree or huge protruding rock outcrop. The tiny round leaves have earned it various names, including the common English name “green penny fern”. In fact the plant has two types of fronds, one fertile (the sporophyll) and the other sterile (the trophophyll). The sterile fronds are nearly round and lay flat to their growing surface and give the plant its characteristic look. The fertile fronds are much more narrow and flare upwards in an arc away from the growing surface.